The sequel and companion volume to C.A. Baylys ground-breaking The Birth of the Modern World, 1780-1914, this wide-ranging and sophisticated study explores global history since the First World War, offering a coherent, comparative overview of developments in politics, economics, and society at large. C.A. Bayly (1945-2015) was Vere Harmsworth Professor of History in the University of Cambridge and a fellow of St. Catharine's College, Cambridge, from 1970 until 2015, and a leader in the field of global history. He won the Wolfson History Prize for his distinguished contribution to History in 2004 and received a knighthood for his services to the profession in 2007. 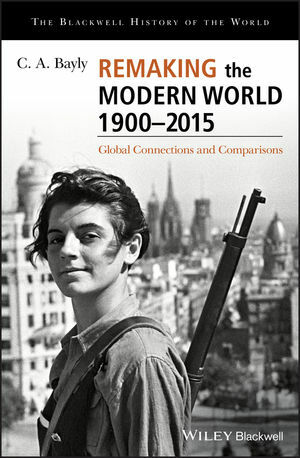 Among his other significant works are The Birth of the Modern World: Global Connections and Comparisons, 1780-1914 (Wiley, 2004); Forgotten Armies: The Fall of British Asia, 1941-1945 (2005) and Forgotten Wars: Freedom and Revolution in Southeast Asia (2007), both co-authored with T.N. Harper; and Recovering Liberties: Indian Thought in the Age of Liberalism Empire (2012). He was a fellow of the British Academy, the Royal Historical Society, the Royal Society of Literature, and the Academia Europaea.In 2016 he became the first posthumous recipient of the Toynbee Prize.